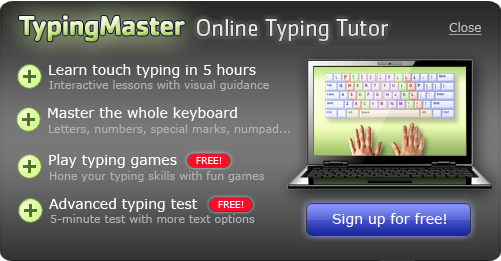 In touch typing all ten fingers take part. With a bit of training even your pinkies will be swiftly tapping the keys. Let's take the whole team to the playground! It's time to start typing! Type each key with the finger that is closest to it - just a quick tap on the key and back to the home base. By learning the shortest paths, each keypress takes only a split second. Your fingers will automatically find the right keys since the correct reaches are stored in muscle memory. No more peeking at the keyboard or hunting for the right keys - typing seems to happen without any effort. Touch typing does magic to your writing. It's almost as if the keyboard disappears and text just flies directly to the screen. Typing becomes faster and easier than ever before and you can give full attention to your text.